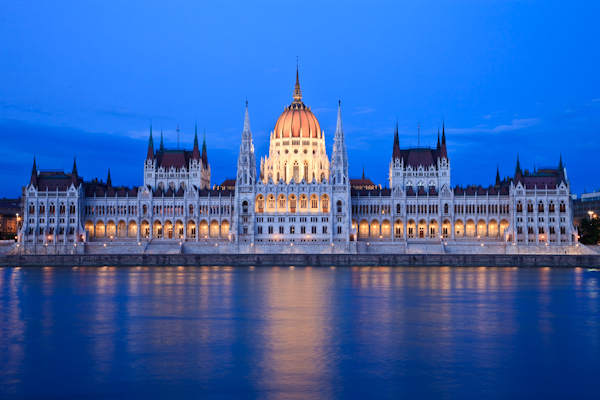 The Hungarian Parliament Building (Hungarian: Országház, literally country house) is the seat of the National Assembly of Hungary, one of Europe’s oldest legislative buildings, a notable landmark of Hungary and a popular tourist destination of Budapest. It lies in Lajos Kossuth Square, on the bank of the Danube, in Budapest. It is currently the largest building in Hungary. Construction completed in 1904 [source: Wikipedia]. I haven’t yet visited the Parliament Building but I photographed this twilight image from the opposite bank of the Danube. I used a slow shutter speed to smooth out the turbulent waters of the Danube. The river is turbulent due to the many sight-seeing small cruise ships that take tourists on trips up and down the river each evening. I had to time my exposures to be between the many passing ships, whose lights would have marred the image. My settings were ISO 100, 6 seconds @ f/16. I would have used my neutral density filters to length the exposure even more, but I did not have them with me at the time. If I have a chance to re-shoot it, then I will try about a 30 second exposure and will post the difference here. This entry was posted in Hungary, Photography, Travel and tagged budapest, hungary, photography.